Today I welcome back TLC Book Tours to The Book Binder’s Daughter with a collection of short stories entitled “The Dunning Man.” I invite you to read my review, learn a bit about the author and enter to win your own copy of the book (US/Can). The stories in this collection all feature men and women who are stuck in unhappy lives and are just trying to do the best they can to live day to day and survive a rather miserable existence. Self-medication with various substances, especially alcohol, is the way in which the characters in these stories manage to muddle through their sad lives. In the story entitled “Dead”, a man is desperately trying to catch a bus and then a train to meet his girlfriend in Atlantic City for a romantic evening. He has recently lost his job so money is tight, but he has just enough to treat her to a nice weekend. While on the train ride to meet her he takes several different kinds of drugs to give him some confidence and then to calm him down. Then he gets a text from this girl saying she can’t make it at the last minute. In “Sullapalooza”, a man who is the narrator of the story shows up to his younger brother’s yearly party at his extravagant house. The narrator is clearly the loser of the family and has had to ask his brother to get him out of trouble quite a few times, which has included bribing local authorities to make DWI charges go away. Although he is married with two small children, it is evident that his drinking is taking a toll on his marriage and family life. This story is interesting because the man’s name is never given and the entire story is told in the 2nd person. In “The Dunning Man”, Connor Ryan is the landlord for several rental properties. He has a crush on one of his tenants named Alice who is a young, single mother and often calls him for help with matters in her personal life. When a famous singer moves in upstairs from Alice, Connor steps in to convince the singer to keep the noise of his orgies and parties down so Alice and her daughter can get some sleep. Connor has some interesting conversations with the singer about love and what we really need in life. The tone and sentiments in these stories are sad as they present characters who are not at good places in their lives. The narratives also end rather abruptly which shows that there is no happy ending, at least not yet, for these characters. 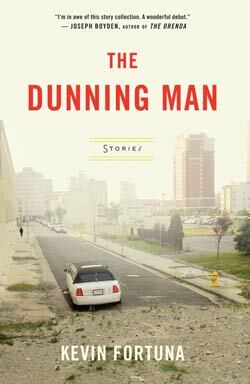 If you are looking for short stories with interesting writing and a stark sense of realism then give THE DUNNING MAN a try. Head over to my Facebook Page and Like and Comment on my post about The Dunning Man. This is for one paperback copy of The Dunning Man collection of short stories. This giveaway is not endorsed by Facebook. It is open to residents in the US and Canada. The winner will be notified via private message and will have 48 hours to respond. Giveaway ends on 11/4 at 5 p.m. EST. Stark is a great word for these stories. I like how the abrupt endings give the feeling that things are not over for the characters.